The surface being made of low-glare and low-friction glass, makes this display easy to see and delivers a smooth touch experience. The Built-in stereo speakers eliminate the need for a separate audio system making it fully functional without any extra peripherals or special setup. The Full-featured solution includes MimioStudio™ classroom software, to easily create and deliver engaging lessons which allow teachers to use built-in tools to easily navigate, store and edit on screen lectures without any hindrance. MimioDisplay 7510U Interactive Touchscreen Display has the ability to enhance classroom sessions by engaging students, creating interest in the lecture being taught. 7510U's exceptional HD display and brilliant image quality enables student to pay attention and presenting unparalleled visual learning experience. With the seamless 10-touch LED display, users have the ability to interact, annotate, save, share and browse all with a single touch. 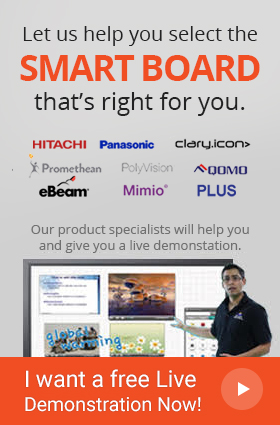 In addition to this, the MimioDisplay 7510U interactive touchscreen comes the built-in MimioStudio™ classroom software that facilitates users further with designing the world class lessons more interactively. This software is jam-packed with all the tools and techniques that the experts use and are now within your reach to leave a lasting impact on the minds of your listeners. Complete integration with other MimioClassroom™ products, including our MimioMobile™ collaboration and assessment app provides multiplatform integration giving teachers the flexibility to work from their mobiles and other platforms of their choosing to work from and edit lectures before beginning a lecture. Q: Does MimioDisplay 7510U Interactive Touchscreen Display has multitouch capability? A: Yes! It allows up to ten single-point touch gestures or five dual-touch simultaneous gestures. Q: Does the user need to set up a separate audio system? A: The device comes integrated with powerful built-in speakers that eliminate the need for a separate audio system set up. Q: Why does the MimioStudio software give MimioDisplay 7510U Interactive Touchscreen Display an edge over its competitors? A: The software comes with several features that can facilitate all the needs of the teachers and enables them to provide the students with an engaging, intriguing lesson. Q: Can MimioDisplay 7510U Interactive Touchscreen Display be used without a computer? A: No, as it is a simply an interactive touchscreen display and hence the user needs a computer to operate on it. Q: What comes in the whole package? A: With MimioDisplay 7510U Interactive Touchscreen Display, you get a power cord, a VGA, USB, HDMI and a stereo audio cable, a remote, 2 passive styli, 4 display mounting bolts with washers and finally a MimioStudio software license.